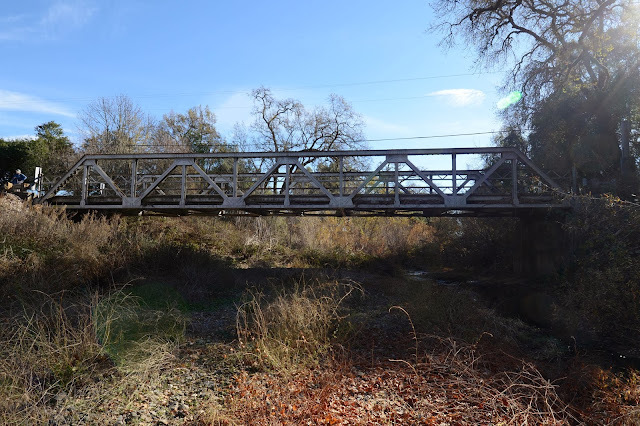 The next bridge carries Lodi Lane across the Napa River. It's a single span pony truss bridge that was built in 1930. This Warren Truss is 100 ft long and it's only 17 ft wide. Craig Philpott has a couple of photos of the Napa River flowing over the bridge on the Bridgehunter Website. Napa County, California Bridges: Lodi Lane Bridge across the Napa River by Mark Yashinsky is licensed under a Creative Commons Attribution-NonCommercial-NoDerivatives 4.0 International License. I anticipate that these steel trusses are much more likely to be replaced than any of their stone arch neighboring spans in coming years.